Growing up I had heard about Cousin Willie. My mom's first cousin on her father's side, Rivkah's son. During World War Two the Jews of America responded to the call to arms and joined the army, navy and air force. Cousin Willie was killed in the "The Battle of the Bulge". He was only 22 years old. They say he was a shy young man, thoughtful, loving, a good brother and a musician. He played the coronet. He wrote home whenever he could, the family still has the letters. I can see that even now, so many years later, he is still loved and missed by the family. 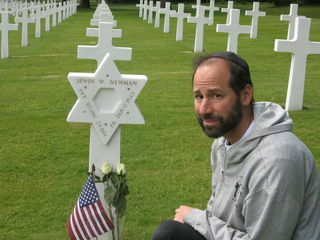 My grandfather, Rabbi Isaac Klein of blessed memory, also enlisted and served as a chaplain. 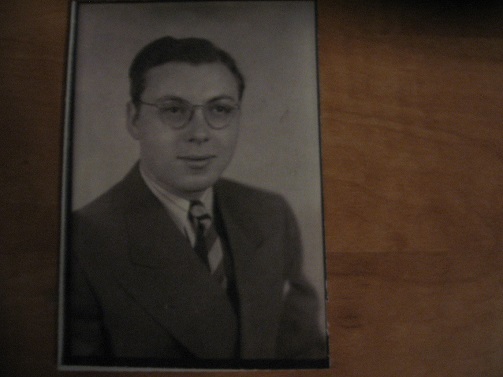 He wrote a book about his experiences during the war, "The Anguish and the Ecstasy of a Jewish Chaplain". He tells how he received many letters from his nephew, Willie Newman, and each time wrote back. He even tried to find him. In each case he was too late; Willie's unit was moving so fast and my grandfathers' letters did not reach him. Willie wrote, "Uncle, why don't you write me?" Willie's mother said, "Isaac, write the kid!" Eventually all my grandfathers' letters came back in the order they were sent out, with the word "deceased" stamped upon them. Willie died thinking his uncle did not care enough to write. The family never got over the loss. Fast forward, May 2011. It has been many years since the end of the war. I am in the Netherlands (known to some outsiders as "Holland") to teach Krav Maga,. We are all friends now. My students include Dutch, German, Belgians - we train together, we eat together, we laugh together and we even discuss the war. It is so difficult to imagine that just a few years ago we would have been shooting at each other. Two of my students invited me to their home in the Limburg region. They tell me they are only an hour and half from Bastonge, one of the key sites of the famous Battle of the Bulge. Would I be interested in visiting the site? My eyes light up. 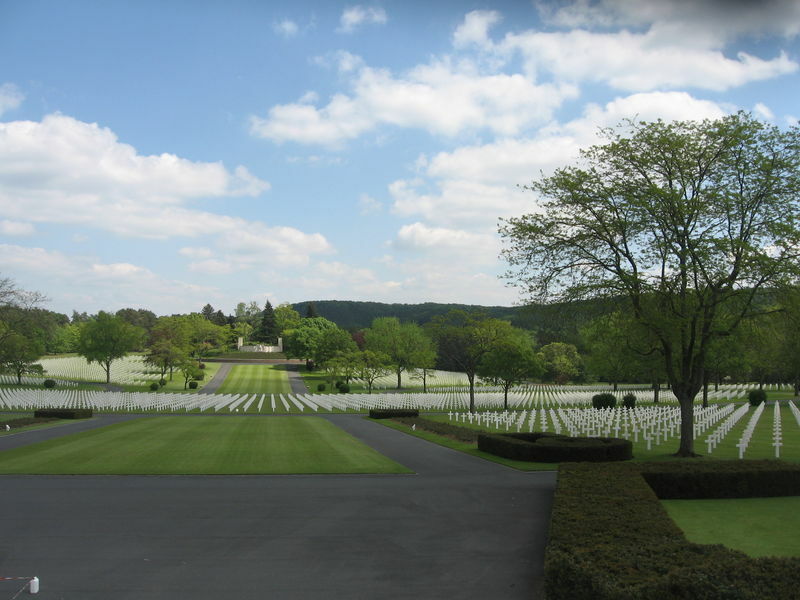 Not only was that one of the key battles of World War Two, one I have studied extensively, but, I tell them, I have a cousin who lost his life during the Battle of the Bulge. We decide to go. But the question is where did my cousin fight? Where did he die? Where was he buried? None of this was known to me. Serve is a bit of a World War Two expert and does some research. 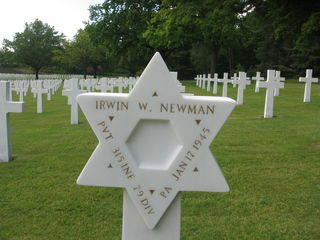 There is no Willie Newman buried anywhere in Europe but there is an Irwin W. Newman of Pennsylvania buried at Lorraine American Cemetery, St. Avold, France, could this be him? I know that Willie is from a small town outside of Pittsburgh, Homestead, PA. It seems this might indeed be him. The cemetery is about 300 kilometers away; it would take us 4 hours to get there, what should we do? I need to know for sure that this is indeed our Willie. I wrote to my mother who directed me to Cousin Harriet, the family historian, who directs me to the other cousin Harriet, who is the sister of Willie. She writes me, yes, his name was Irwin Wilbert Newman: "I hope you CAN FIND Willie. 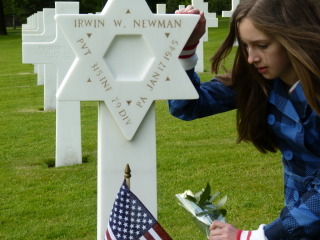 He was a wonderful brother, and I was nine years old when he died in action in the Battle of the Bulge." I show this to my my student Serve, he gets emotional and says, "That settles it, we are going, we are going to find your cousin Willie." And so it will be. 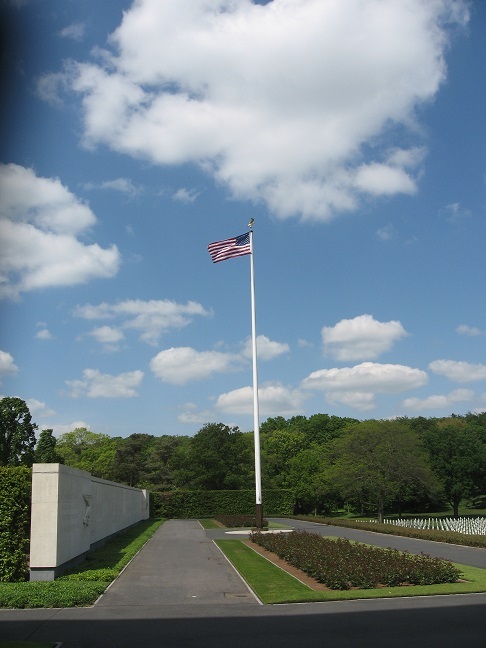 Serve has already adopted three American graves in the American military cemetery in Margraten , Nederlands. He feels the European people owe the Americans a great deal. He and his wife take their young daughter Eva with them and teach her that someday she will inherit the honor of visiting these graves and bringing them flowers. During all our visits of historical sites Eva is with us, she is learning history first hand, she is understanding her roots, not from a book but from touching the ground where history took place. When the day comes we pack up some food and head on our way. Serve stops at the flower shop to pick up some flowers for Willie. We drive. We see the beautiful country side, cows, (koeien) horses, (paarden) sheep (schapen). The exit signs read "afrit" and "UIT" in Dutch. We cross the border into Germany. Everything is the same except the signs now read, "Ausfarht". There are no guards, no security to be seen anywhere. We stop for coffee, I am finally getting the hang of the Dutch language and now it is back to German! Soon enough the signs will read "Sortie" (when we cross into Belgium). 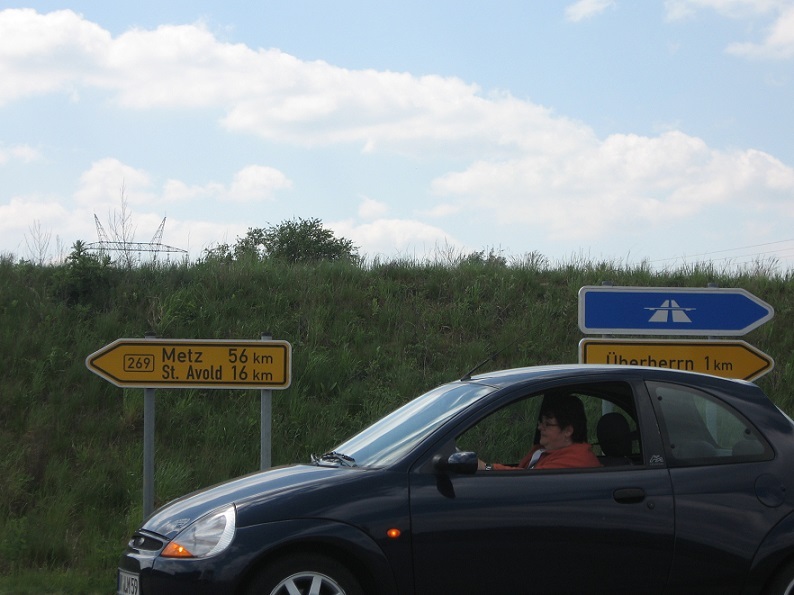 Back on the road, we pass signs for Aachen. The name rings a bell, this was where Anne Frank's family lived after fleeing Frankfurt, Germany, before settling in Amsterdam. 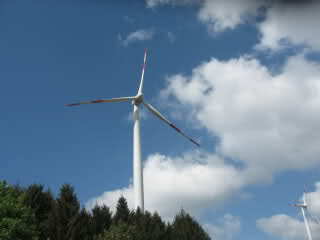 It is also a famous battle site, the first German city conquered by the Americans in World War Two. Perhaps I will see it on another visit but now we must find Willie. 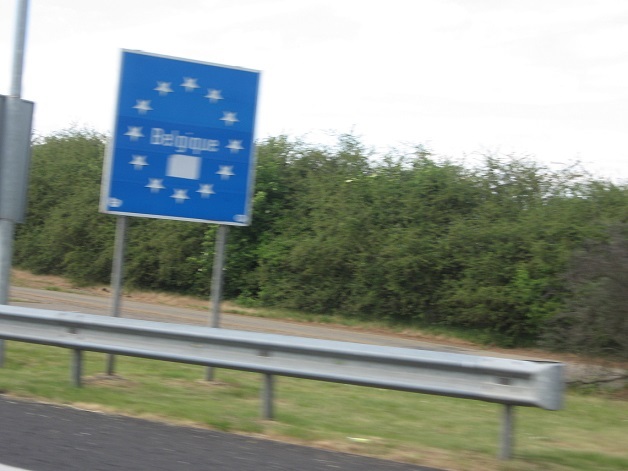 Hours of driving and now we cross an invisible border to Belgium. Everything is so peaceful; I close my eyes and try to imagine this place during the hell years, the Nazi era; no open borders, only people killing each other, bombing each others' towns and farms. On these peaceful picturesque lands many thousands lost their lives. Soon we are driving through the Ardennes forests where of course the last great battles took place. The German forces caught the Americans by surprise. 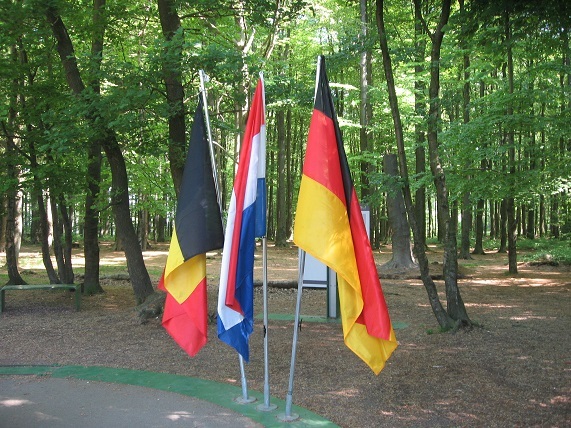 On December 16, 5:30 a.m. 1944, 200,000 German soldiers stormed through these forests. American soldiers were woken by sounds of explosions and tank fire. We drive south, heading towards France. None of us speak any French. My thoughts turn to Willie. I try to connect with the battle, with him, I imagine a young man, the cold; it was the coldest January on record, the land was covered with snow. The fear, the uncertainty of combat, Grandpa trying to catch up with him but not succeeding, the family back home on pins and needles. Willie had been injured in combat. The family received a telegram, Willie earned a "Purple Heart" but was soon back in combat. It is a beautiful day, everything is green. Everything is so peaceful now but in my mind I hear the gunshots, see the explosions, see the snow and the young men in the trenches, or running for cover, tired and cold, I feel like saying ..."Cousin Willie, we have not forgotten you. We have not forgotten your sacrifice. We are coming to visit you." We are driving patiently, no one is complaining, we all feel we are on a mission. Today it is sunny and warm but my thoughts turn to the bitter cold winter of 1945. The Nazis chose the worst weather to attack so that the Americans could not employ their vastly superior air force. It was too cold and snowy to fly. The Americans were short on supplies, were caught by surprise and had to hold back the advancing enemy at all costs. And this cost was human lives. Over 19,000 Americans lost their lives here, and among them was Cousin Willie. We cross the border to France, and begin to see the signs for St. Avold. We continue to drive, we all feel the anticipation, no one is speaking, the radio is silent. I walk into the visitor center. A kind French woman. Mrs. Muller, greets me. "Can I help you?" "Yes,", I say, "I am here to visit my cousin". She looks up the name and says he is not here. But, she wrote Erwin instead of Irwin. "He is here", I said. I did not come all this way for nothing. She finds his record, indeed Willie is here. "I will take you to visit your cousin. How old was he?" "Twenty Two" I answer. "Oh, how tragic, but all the young men buried here are so young, it is all so tragic." Mrs. Muller works here but the directors are only Americans, that is the rule, only an American can be in charge of these grounds. 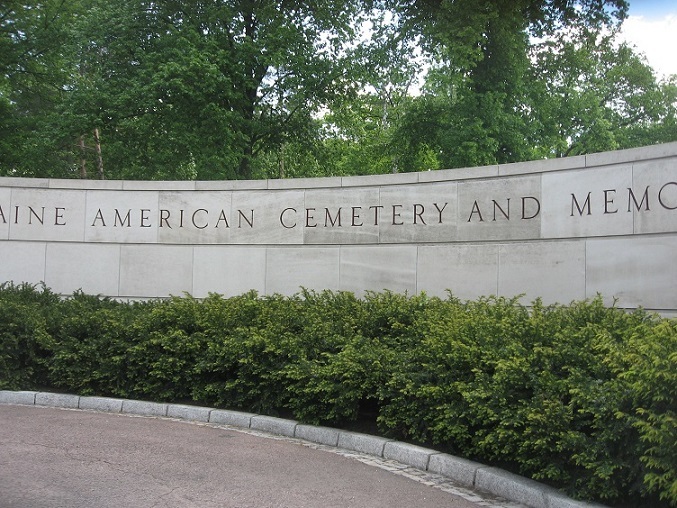 There are 10,489 American soldiers buried here. An entire community that is silent, totally silent. The experience is beyond words. We walk, I am walking among heroes. Every one of these markers was a person, with a name. I read the names. The graves are silent. We walked quietly, I saw many Jewish stars. 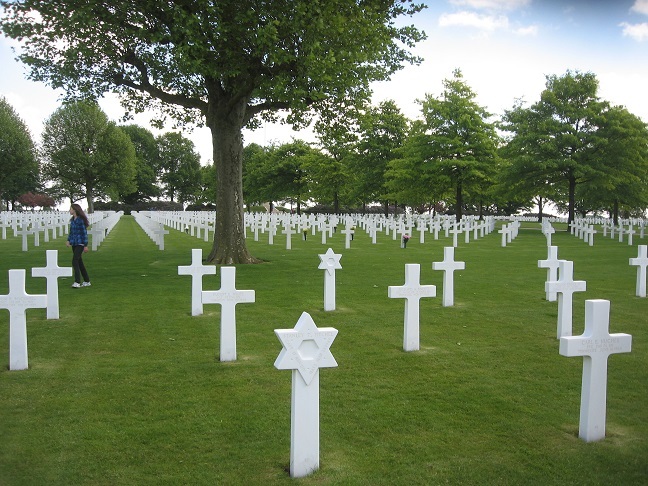 "There are 202 soldiers of the Jewish faith buried here" she said. And there he was, Irwin W. Newman. Private, 315th Regiment, 79th Infantry Division, Pennsylvania, January 17, 1945. The French lady said that in the photos it is difficult to see the writing, so she puts sand on the name so it shows up better. The sand is special; it is from Utah beach in Normandy, where Willie landed. I tell her that my grandfather landed in Utah Beach, Normandy as well. 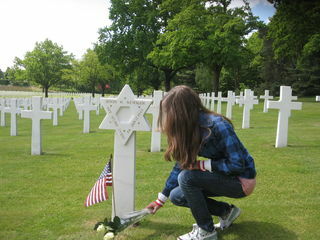 She gave me a small American flag to place at his grave. The relative then takes this flag home. On the way back to Israel many people commented on the American flag I was holding. I explained this was no ordinary flag but the flag that stood briefly at the grave of my cousin who gave his life for freedom. I told the story again and again, and always people listened in silence, visibly moved. More and more people "met" Willie. They wanted to know all about him. His story had come to life. I had never met Willie in his lifetime but here, I felt so connected, a debt to be paid. What a feeling, we drove through Holland, Germany, Belgium and France for this one moment, a brief visit. Eva placed the flowers on his grave. I said the Kaddish (The Jewish mourners prayer) for him; I was so chocked up with emotion that at one point I had to stop. I prayed silently. All the feelings came swelling up at once; his death in combat, Grandpa searching for his nephew, Willie writing to Grandpa, "Uncle, why don't you write?" But now I am here, making the visit that my grandfather so longed to make. I felt like I had closed a circle. I said to him, "Please know that your uncle tried very hard to find you, but I assume you know that by now, as you have met up in the afterlife". I can picture my grandfather, with that twinkle in his eye, putting his hand on Willie's shoulder. I know this matter gave him no rest, but now the visit has finally taken place. I am here on behalf of Grandpa and the entire family. Willie, we salute you. Silently I introduced myself ..."I am your cousin", and I explained the exact relationship. We had come a long way to pay respect to a young man, one of so many, who helped stop the evil that threatened to take over the world. We must sometimes stop and think, that this freedom we enjoy is not free, someone paid for it and dearly. Some young men were told - you will hold this line, you will stop the enemy, and so they did. The world today might look very different had it not been for these heroes. The lady played the "Taps" in honor of Willie. (see video at bottom of this page). The military burial music was heard throughout the cemetery, I felt that we were all paying respect to Willie. We were saluting Willie. This was his moment. Willie you are not alone and you are not forgotten. I said good bye and then visited as many of the Jews there as I could, I felt they should be visited by a member of the faith. Many were from New York, I found three with the family name Katz, all young men who died in battle. I said to each on: may your rest be a peaceful one. "to these men and their comrades We owe a debt to be paid. 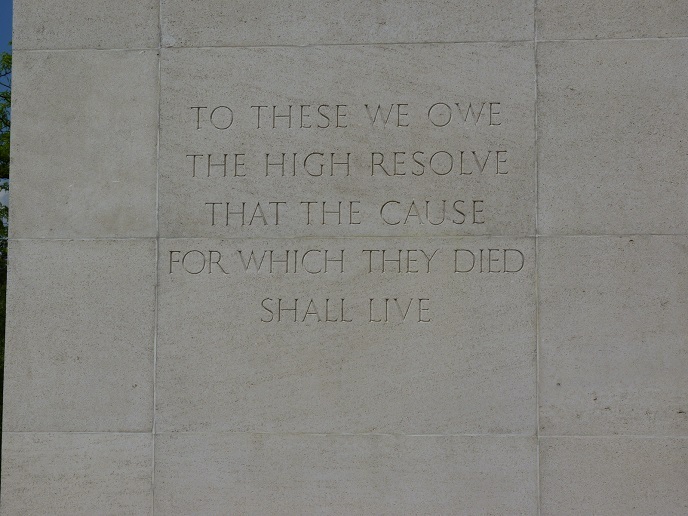 with grateful remembrance of their sacrifice and with the high resolve that the cause for which they died shall live"
Inside the chapel, respect is paid here to both Jews and Christians who fought side by side, died together and were buried together. 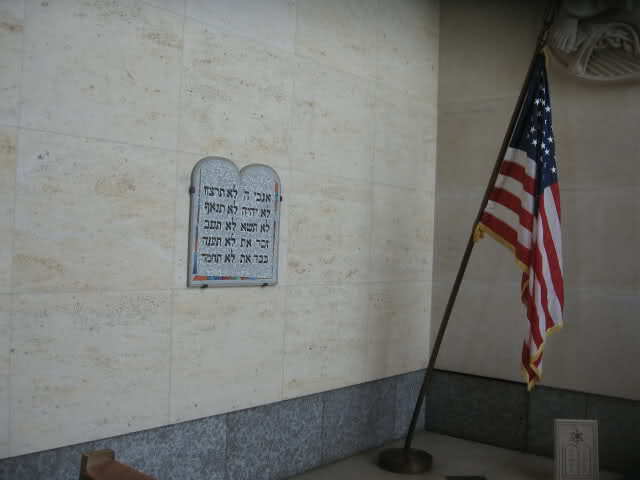 Here are the ten commandments in Hebrew next to the American flag. I spent a great deal of time trying to trace Willie's route. 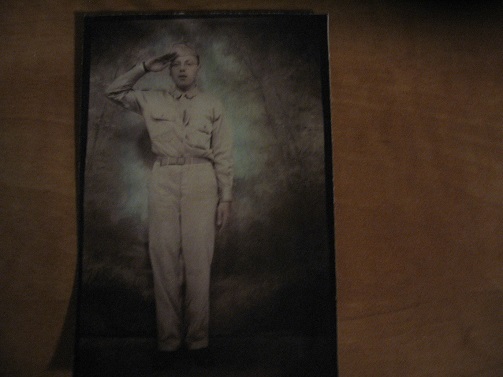 I know he trained in the south (USA) and landed at Utah Beach, Normandy, France on the 14th of June, 1944. I managed to piece together some information from various sources, it is possible that I have made some mistakes. There is no one alive who seems to have all the details. On the internet I found many people doing the same search but I could not find enough information on the final days. Willie was with the 79th division, 315th Regiment. December 9 - 11, 1944 - Battle of Hagenau - The 315th was to lead off the attack at 06:45, 9 December. December 11 - The Germans had withdrawn sometime during the night. January 8 - January 19th , 1945 - Willie's last battle - The 11 day battle. In the Alsatian towns of Hatten and Rittershoffen, both just north of the Hagenau forest; "Both sides agree that these were the hardest fight in the western frontier. The troops that were in Anzio might say even ´worse than that, heavy fighting from house to house..."
"The battleground now began to resemble a general melee. Between 10 and 20 January General Smith's 14th Armored Division, which assumed operational control of assorted infantry units of the 242d and 315th Infantry above the Haguenau forest and was supported by most of its own artillery plus that of the 79th Division, fought a sustained action with Decker's panzers. The German commanders, in turn, reinforced the attacking troops on the night of 13-14 January with the 20th Parachute Regiment (7th Parachute Division), and on the 16th with the 104th Infantry Regiment (47th Volksgrenadier Division), thereby steadily raising the stakes of the contest. But along the entire front of the VI Corps, division and regimental commanders gradually lost control over the battle, and the struggle devolved into a fierce tactical conflict between opposing battalions, companies, platoons, and smaller combat units." This must be where Willie died, the battle of all battles, they lost perhaps one-third of their combat strength in men . He died on January 17th, 1945. I do not know exactly where at this time. It is clear that he survived many battles and lost his life in one of the fiercest battles of the campaign. On the forums I have found many people trying to find out about their relatives but those who can answer are no longer around. We do know that they died fighting the battle of their lives.